Aries Suites offers an ideal accommodation for business and leisure travellers. It is a top hotel sited in a serene environment at Plot 2, Block 12, Ogun Street, Osborne Foreshore Estate, Ikoyi, Lagos, Nigeria. Rooms available are categorised into Standard, Medium, Double Executive and Studio Rooms. 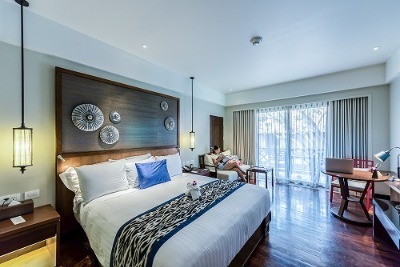 Each room is furnished with a flat-screen TV with satellite connection, king sized bed, intercom, paintings, work desk/chair, fridge and an en-suite bathroom. Complimentary breakfast is available. Its on-site restaurant serves a variety of meals, from local to international cuisines. Guests can order a wide range of alcoholic and non-alcoholic drinks at the outdoor bar by the pool. Guests can also enjoy swimming sessions at the pool. Wi-Fi and ATM are available on the premises. Daily newspaper service, dry cleaning, airport pick up and car hire services are available on requests. Q: Are parking facilities available at the Aries Suites? A: Yes. There is an adequate parking space. Q: Does the Aries Suites have a restaurant? A: A restaurant that offers a range of expertly prepared dishes for guests is available. Q: Are there any fitness facilities at the Aries Suites? A: No. It doesn't have a fitness facility. Q: Are Internet facilities provided for guests at the Aries Suites? A: Guests at the Aries Suites get to enjoy a provision of free wireless internet facilities. Aries Suites is a budget hotel in Ikoyi, Lagos. It was a very good and convenient stay for me. The environment was lovely and comfortable. The room service staff were helpful. Also, the room I stayed in was comfortable, beautiful and spacious. Lastly, the facilities in my room worked perfectly. I like this hotel! Everything in the hotel meets up to international standard, I must say. Very neat and pampering services on offer as well. I will surely visiting again. The hotel was really a nice place to stay, the room was comfortable and neat.The bathroom was clean and water was available. The hotel had excellent customer service, their staff were hospitable and I really enjoyed their foo., The food was tasty and affordable. I believe it's a good place and I would recommend it to my family and friends. The hotel is excellent and I really enjoyed my stay. It was beautiful. Have nice pictures of Aries Suites?